Recognized for: Offering students comprehensive law-themed programs through which students participate in Supreme Court cases and become informed citizens. 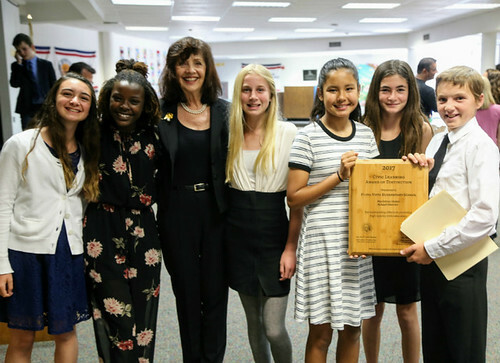 Students at Flora Vista learn citizen responsibility by exploring the rule of law and engaging in the judicial process. Students participate in Research, Discuss, Act using California Supreme Court cases geared toward literacy and research skills. The yearly mock election goes beyond a one day simulation; students also debate current issues and explore the electoral process. Provide instruction in government, history, law and democracy, and avoid teaching only rote facts about dry procedures. Discuss current local, national and international issues and events in the classroom, particularly those that young people view as important to their lives. Conduct community service that is linked to the formal curriculum and classroom (Service-learning). Encourage student participation in school governance. Encourage students’ participation in simulations of democratic process and procedures such as voting, trials, legislative deliberation, and diplomacy.